If you enjoy harmless pranksterism – either perpetrating it or consuming it – Cheap Laffs: The Art of the Novelty Item will be right up your alley. 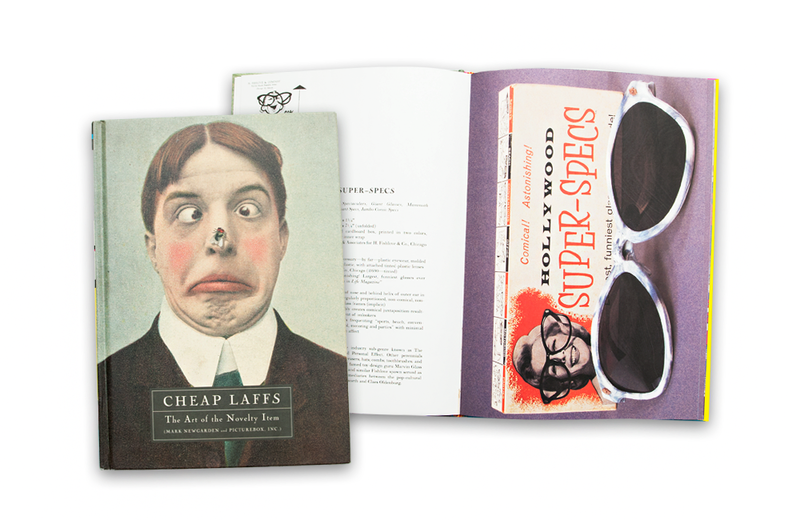 From joy buzzers to whoopie cushions, fake dog poop, snake nut cans, and much more, author Mark Newgarden provides a smart look at the corny heyday of gagdom. Cheap Laffs sets the context in Chapter 1, Laff History, in which Newgarden provides a historical review of the “Joy Industry”. This is a loose network of highly competitive novelty toy manufacturers and retailers. Special attention is paid to some of the industry’s heavyweights, including The Richard Apple Co.; Johnson Smith & Co.; and, my personal favorite, H. Fishlove & Company, purveyors of, among other things, fake barf. After the opening history lesson, the book catalogues classic and less well-known novelty items that probably appeared for sale at your favorite childhood variety store or drugstore. Each gag is given equal billing, complete with a full-page photo and write-up that provides dates, descriptions, manufacturers, retail pricing, and dimensions. Newgarden, also one of the creators of the Garbage Pail Kids trading cards for the Topps Company, also infuses a bit of snark in his Notes section for each item, routinely reveling in the absurdity of some of the offerings. Toy Soldier Collector is a print and digital publication catering to both the ardent and occasional collector of toy soldiers and toy soldier-related merchandise.